We will be recognized as having professional standards. Our employees will possess superior knowledge and skill for the benefit of our clients. We are here to consistently and diligently meet the needs of our clients. By providing the highest quality products, services, advice and sustainable value, we will ensure our clients receive excellent solutions to meet their individual needs. The highest levels of honesty and fairness characterize all of our dealings. We develop trust by maintaining the highest ethical practices possible. Our clients depend on us to provide them with sound advice they can trust. We earn this confidence by sustaining an uncompromised commitment to continuous improvement in everything we do. This philosophy enables us to best serve our clients. Our employees will determine our future success. In order to attract and retain the best and brightest employees, we will continue to invest in the development of our human capital and reward superior performance. 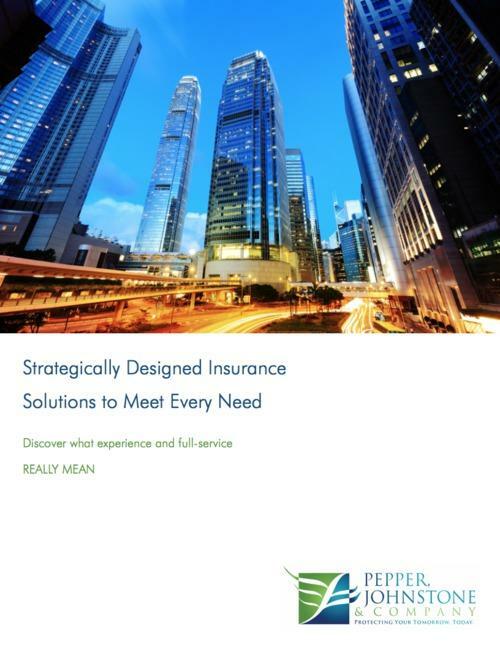 To be the clear, best choice for providing insurance, risk management and investment solutions to our clients through teamwork, technology, innovation, industry knowledge and unsurpassable client service, while supporting our community and stakeholders. Pepper, Johnstone & Company was established in 1971 as a privately held insurance brokerage. Unlike national firms whose decision-makers are located elsewhere, we are local, influential and responsive. While we are domiciled in Alabama, our client-base extends to AL, GA, MS, NC, SC, LA, and TN. Although much has changed in our industry over the past 47 years, our steadfast commitment to properly protecting and advising our clients remains the same. We are located in Athens, Alabama, and are also licensed in Georgia, Mississippi, North Carolina, South Carolina, Louisiana, and Tennessee. I just wanted to let you know how much I appreciated your numerous interventions and attention to detail during the work on my house. Through the entire process there was never a doubt in my mind that you had my best interest at heart. I have experienced agents/brokers in the past that were most helpful until the sale was complete then not quite as much. That is certainly not the case with you. Once again I appreciate it greatly! Pepper, Johnstone, & Company has become a crucial member of our business support team over the past several years. At the start, they performed an analysis of our business needs, our exposure areas, and determined the most comprehensive, yet economical, method of coverage. Their attention to detail ensures coverage lapses do not occur and that all proof of insurance requests from our clients are quickly met, typically in the same day. I have no concerns about liability exposure knowing that Pepper, Johnstone, & Company is looking out for us. I highly recommend their services to any business owner. Bryan is extremely knowledgeable with regards to all facets of insurance coverage and necessary policies. I trust him completely because I know that he understands the nuances and I know that he has integrity. When he makes a recommendation, I know it is in my best interest. He takes good care of both my personal and business insurance needs. I would not call anyone else about my insurance but Bryan. All the employees at Pepper, Johnstone & Company are very professional and knowledgeable. They take care of many issues in a timely manner – exceptional customer service. I am very pleased with my choice to have all my insurance with Pepper, Johnstone & Company. I view the discretion you and Travelers have shown based on the facts as a whole as a high degree of wisdom…if this whole thing goes through despite Murphy’s Law #2 (if you see a light at the end of the tunnel it is probably a freight train), then I will certainly consider you to be wise counsel. This Thanksgiving, one of the many things I am thankful for is an outstanding insurance agent/broker – you. Excellent customer service, never have to call more than once. Wonderful people! I have total trust in Pepper, Johnstone & Company. Great staff, and my insurance requirements have always been met. The staff is outstanding. I filed an auto claim on Tuesday and my check was in the mail on Thursday. They’re always most helpful. Excellent service and rates. Pepper, Johnstone & Company is prompt and our adjuster was easy to work with. Great coverage for the cost! Courteous. Professional. Everyone is always very helpful and nice about everything. Many thanks. These are all wonderful, helpful people. Competitive prices. Very good service. Appreciate always being able to reach someone live. More than one person knowledgeable & able to help me. Everybody treats me as if I’m their only client. Bryan & Kellie are so very knowledgeable and friendly. I love having such a quick turn-around time on invoices and changes to our policies. We are very satisfied with Pepper, Johnstone & Company. They handled [our claim] quickly and without any problems. Great personnel! Claim processed no problem. Prompt. We are very satisfied with Pepper, Johnstone & Company. Great Agency – always helpful. Very fast and competent service! Pepper, Johnstone & Company has always been very helpful. My insurance advisor/broker does a great job. Pepper Johnstone & Company takes excellent care of us. They are the only insurance people we would use. Very satisfied. Professionalism and promptness of providing new policies. Extremely satisfied with the policies, service, and service provided during our claim. Any communication with this agency is pleasant, from the office staff to the agents. I am very satisfied with the policies and service provided. Always helpful and available when needed. Provides accurate responses and completes research, if necessary. Phone calls, paper work, answers to questions are all done quickly and professionally. William Pepper is outstanding! He’s honest, sincere and always available to help us; a true southern gentleman. Pepper, Johnstone & Company exceeds our expectations. We are especially pleased with the prompt attention and service. Everyone is always very easy to work with. Very good people that are good at their job. I am very satisfied with Pepper, Johnstone & Company – a great bunch of people to work with. And the adjusters are easy to talk with and they get the job done! Every claim is paid promptly. Pepper, Johnstone & Company has provided excellent service to me and my family for many years. We are extremely satisfied with Pepper, Johnstone & Company. These are great folks to deal with. We are extremely satisfied with our advisor. Not only does he find the best ‘product in a category’ as an independent broker, but he reviews and discusses insurance needs from a macro perspective. Bryan Johnstone is a great advisor and great person! We love you and your staff and your thorough prompt service. Thank you so much! We couldn’t be happier with Pepper, Johnstone & Company. They are the best in their business – extremely competent, knowledgeable, professional and willing to go the extra mile to take care of my family and businesses. Pepper, Johnstone & Company is excellent. Our agent takes time to make us feel like we are the only clients. They are very thorough and work hard to make sure there are no gaps in coverage. We were especially impressed with how fast their response time is after a disaster. Plus they totally took care of everything without any stress on our part.